One of the primary challenges that many beginners face when creating a website is the technical elements that sometimes seem to require a degree in IT to figure out. Technologies like CSS, HTML and CMS can be extremely intimidating for someone who is new to creating websites. But the good news is that WordPress has made it easy for the everyday person to create a website and add their video content. Thankfully the creators of WordPress long ago understood the need for a website platform that was extremely easy to use – even for beginners. WordPress was first introduced in 2003 primarily as a blogging platform, but has exploded in growth over the past 11 years. In fact according to Wikipedia, WordPress was being used by just over 23% of the top 10 million websites as of January 2015. No longer just a blogging platform, WordPress offers a full suite of features that can be used to create highly interactive websites, all with very little programming knowledge. There are scores of reasons why WordPress is popular. Below are just a few of the primary reasons why millions of website owners are choosing WordPress for their publishing platform of choice. As mentioned above, WordPress is extremely easy for website owners to use. Many hosting providers offer simple one-click installs, which allow you to install a WordPress site on your web server in just a few minutes. 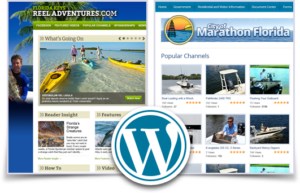 Once your WordPress website is created, that’s when the real fun begins! Have you ever seen a feature on someone’s website that you thought was really cool? Maybe it was a popup email sign up form or a snazzy slider that scrolled through multiple images. If you were trying to implement these complicated features into a hardcoded website, you would likely have to hire a developer to accomplish this type of functionality. With WordPress, the plugin search will soon become your best friend! Since there are so many people using WordPress, an entire industry of WordPress developers has emerged that have created all sorts of plugins offering loads of incredible features. Chances are that if you find a feature that you like on a website, there is a WordPress plugin that can be easily installed on your website that offers the same functionality. Another benefit of the huge WordPress user base is that a large number of designers have created WordPress templates that are either free or extremely inexpensive that can be used to give your website a professional look. Are you a photographer looking to show off your work, or maybe a band member looking to book your next gig online? By searching through the thousands of WordPress themes you can find a layout that caters to your user base and will allow you to more effectively grow your website following. Over the past few years the number of users accessing the Internet from their mobile devices has exploded. In fact, 2014 was the first year where more people accessed the Internet from a mobile device rather than from a desktop or laptop computer. This seismic shift in the device preferences of the average Internet user has caused website owners to scramble to ensure that their websites are properly optimized for mobile devices. 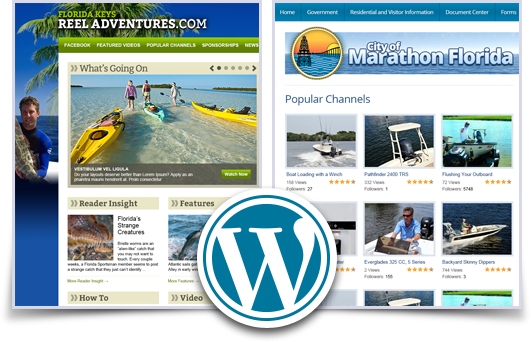 WordPress offers website owners the ability to look for themes that are already completely responsive. This means that no matter what type of device your users will use to access your website, they will be presented with an optimized website that will load quickly and look great on their device. Not only can website owners be rewarded by their user base for offering a responsive website, but search engines are starting to favor sites that have been optimized for mobile devices as well. Take a moment and search for your website on Google and see if you see the phrase, “Mobile-friendly.” If you don’t see this phrase beside your listing, your site is not optimized and it may be time to switch to WordPress! Another benefit of WordPress is the ease with which you can add videos to your website. Follow the steps below to add videos to your website in just a few clicks. If you are using TikiLIVE, navigate to the video that you want to share on your WordPress website and under the “Share This Video” tab, view the Embed Video code. Copy this code to be placed into your WordPress website in a few steps. Navigate to the page or blog post where you would like to add the video. Paste the embed video code that you got from your TikiLIVE account in step 1. Publish your blog post or page. Your video should now be live on your WordPress site. TikiLIVE works extremely well with WordPress. You can easily add videos to your website using the steps above or you can actually use the WordPress module that is natively supported within TikiLIVE. After you sign up for a TikiLIVE account you should see a WordPress icon on the left menu bar of your account. If you do not see this link your TikiLIVE account likely does not have the account permission. Simply check the Upgrade page to select a subscription package that has the WordPress feature. Once you’ve received proper access to your WordPress site from within TikiLIVE, any video content that you publish or change within your TikiLIVE account will be instantly updated on your website. Still Confused About Publishing Videos to Your WordPress Website? If you are still confused about exactly how to publish your videos to your WordPress website, give our customer service experts a call today at 305-289-4557. We can easily walk you through this process and help you unleash the power of WordPress.